Information processing in sensor networks is a rapidly emerging area of computer science and electrical engineering research. Because of advances in micro-sensors, wireless networking and embedded processing, ad hoc networks of sensor are becoming increasingly available for commercial, military, and homeland security applications. Examples include monitoring (e.g., traffic, habitat, security), industrail sensing and diagnostics (e.g., factory, appliances), infrastructures (i.e., power grid, water distribution, waste disposal) and battle awareness (e.g., multi-target tracking). 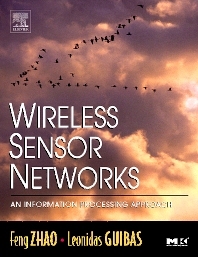 This book introduces practitioners to the fundamental issues and technology constraints concerning various aspects of sensor networks such as information organization, querying, routing, and self-organization using concrete examples and does so by using concrete examples from current research and implementation efforts. "This book provides both an insightful overview of the emerging field of wireless sensor networks, and an in depth treatment of algorithmic signal and information processing issues. An excellent text for both professionals and students!" Feng Zhao is a senior researcher at Microsoft, where he manages the Networked Embedded Computing Group. He received his Ph.D. in Electrical Engineering and Computer Science from MIT and has taught at at Stanford University and Ohio State University. Dr. Zhao was a principal scientist at Xerox PARC and directed PARC’s sensor network research effort. He is serving as the Editor-In-Chief of ACM Transactions on Sensor Networks. Professor Guibas heads the Geometric Computation group in the Computer Science Department of Stanford University, where he works on algorithms for sensing, modeling, reasoning about, rendering, and acting on the physical world. He is well-known for his work in computational geometry, computer graphics, and discrete algorithms. Professor Guibas obtained his Ph.D. from Stanford, has worked at PARC, MIT, and DEC/SRC, and was recently elected an ACM Fellow.